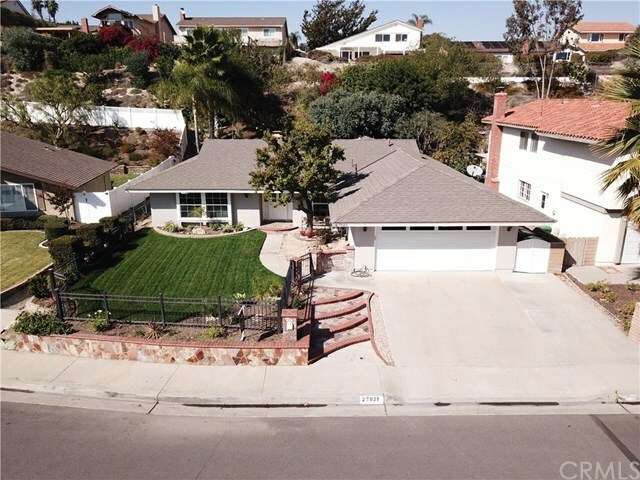 A Charming 2000 Sq Foot, Single-Story located in one of the best areas of Mission Viejo. This amazing family home has it all with 4 Bedrooms, 3 full Baths and spacious Front and Backyard Areas. There is a custom brick mailbox and a beautiful Gated Front Entry. The Stairs and Planters have brick and slate detailing and the exterior has been recently painted. The front and back yards have been newly trimmed and freshly landscaped. Both areas provide the perfect setting for intimate or large gatherings of Family and Friends. The Living Room is light and bright with an expansive picture window and opens to the Dining Area. The Family Room has a Vaulted Ceiling, custom lighting and is anchored by a warm and inviting Brick Fireplace. The remodeled Kitchen has Granite Counters, Stainless Steel Appliances and Custom Cabinets. The large Master Suite with bathroom has an oversized shower, a versatile seating area, walk-in closet and easy access to the lushly Landscaped Backyard. The second Master Suite has its own bath with shower and walk out access to the gorgeous backyard. This special home hosts two additional guest/family bedrooms and a third bathroom conveniently located in the hallway for easy access. This is an incredible opportunity to purchase a single story, move-in ready family home.